The 2017 Treaty for the Prohibition of Nuclear Weapons (TPNW) was negotiated at the UN over the objections of nuclear-armed and -allied states and established a global categorical ban on nuclear weapons framed in terms of humanitarianism, human rights and environmentalism. The TPNW also placed ‘positive obligations’ on states to assist victims of nuclear weapons use and testing and remediate contaminated environments. States and NGOs from the Pacific region advocated for a strong treaty text, particularly its positive obligations. They were influenced by the region’s history as a site of nuclear weapons testing in Marshall Islands, Kiribati and French Polynesia/Te Ao Maohi; the 1985 South Pacific Nuclear Free Zone’s precedent; and earlier diplomatic efforts and activism linking denuclearization with decolonization. In doing so, Pacific and other formerly colonized states flipped the ‘standard of civilization’ script embedded in humanitarian disarmament law and applied it to their former colonizers. 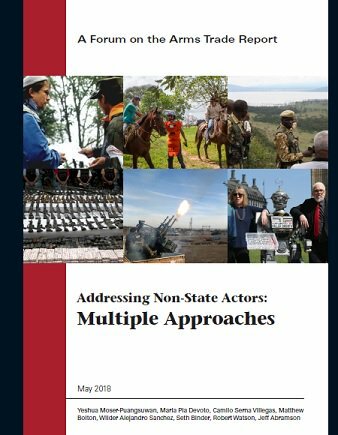 The paper demonstrates the agency of small states—the ‘-Pacific’ part of ‘Asia-Pacific’—in multilateral policymaking on peace and security, often overlooked in international relations scholarship. It draws on my participant observation in the Nobel Peace Prize-winning advocacy of the International Campaign to Abolish Nuclear Weapons (ICAN) during the TPNW negotiations. 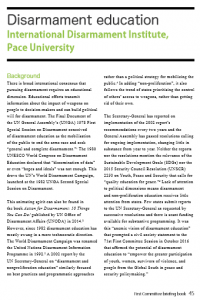 The International Disarmament Institute has provided an article on the disarmament education policy agenda for this year’s First Committee Briefing Book (2018), which provides guidance to delegates and advocates attended the UN General Assembly’s meetings this coming fall on disarmament and international security. The successful negotiation of the 2017 Treaty on the Prohibition of Nuclear Weapons (TPNW) has provided new political and legal impetus for disarmament education. The preamble specifically recognises “the importance of peace and disarmament education in all its aspects and of raising awareness of the risks and consequences of nuclear weapons for current and future generations, and committed to the dissemination of the principles and norms” of the TPNW. It also stress the role of multiple stakeholders in pressing for nuclear disarmament. This framing represents a welcome turn toward a more vigorous approach to disarmament and non-proliferation education. 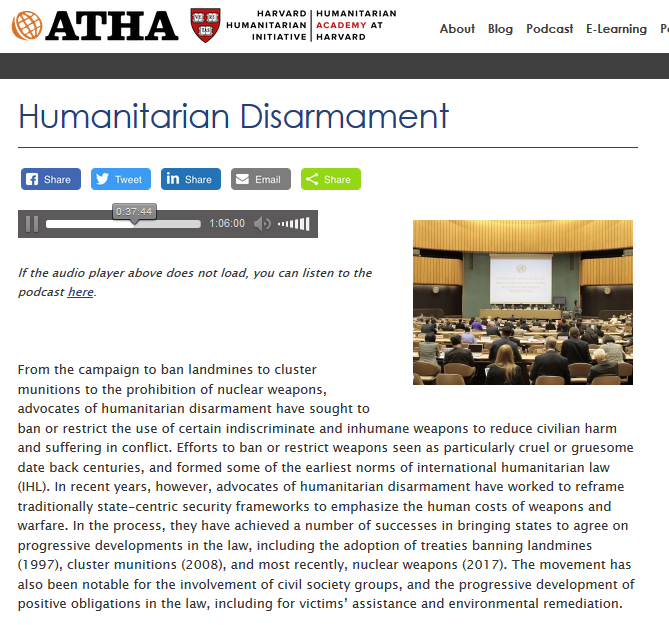 First Committee will likely pass a disarmament education resolution this year, and the TPNW and UNODA’s Occasional Paper offer opportunities to educate governments on their responsibilities to support disarmament education, as well as build political will. To read our article, click here. 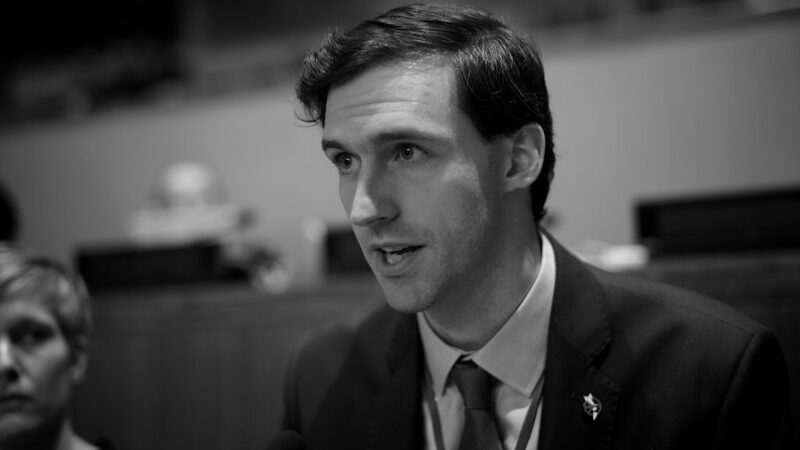 Pace University plays a globally recognized leading role in disarmament education. Its Peace and Justice Studies major is among the largest undergraduate programmes in the United States of America. Faculty members offered relevant classes, including Model United Nations and Global Politics of Disarmament and Arms Control. Pace students engaged in disarmament internships, on-the-job training and service-learning placements. The report specifically acknowledges the involvement of Pace faculty and students in the International Campaign to Abolish Nuclear Weapons (ICAN), recipient of the 2017 Nobel Peace Prize, as well as Pace’s International Disarmament Institute’s dissemination of “research and … technical assistance to States and non-governmental organizations involved in disarmament policymaking.” It notes Pace’s UN-funded training on the Arms Trade Treaty in East Africa, conducted in partnership with Control Arms. Bolton spoke primarily about the victim assistance and environmental remediation obligations in the 2017 Treaty on the Prohibition of Nuclear Weapons, highlighting findings from recent research in Kiribati. 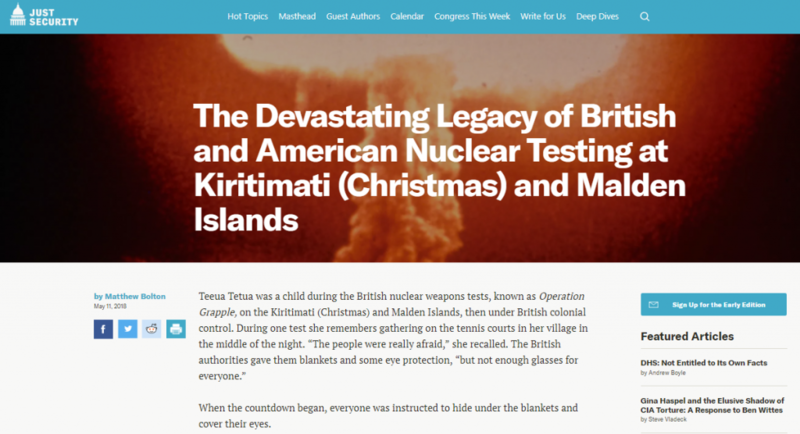 Radio New Zealand Pacific covered the new Pace University International Disarmament Institute reports on the humanitarian and human rights impact of UK and US nuclear weapons testing on Kiritimati (Christmas) and Malden Islands. 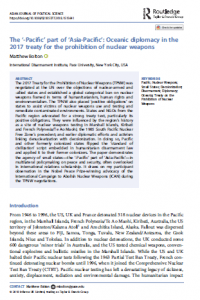 Dr. Matthew Bolton, director of the International Disarmament Institute, argues that the 2017 Treaty on the Prohibition of Nuclear Weapons offers an new normative framework enabling assistance to victims and remediation of contaminated environments through international cooperation and assistance. A version of the interview also appeared in The Fiji Times. As illustrated by the lack of availability of a key environmental survey (pictured above), there is very little public information available on the health and environmental risks of UK and US nuclear weapons testing at Kiritimati (Christmas) Island, now in the Republic of Kiribati. Sydney Tisch ’20, Undergraduate Research Fellow in Pace University’s International Disarmament Institute, reflects on the difficulties of finding information about UK and US nuclear weapons testing at Kiritimati (Christmas) and Malden Islands: “That documents were seemingly impossible to find shows whose lives and bodies we in the West care about and whose we don’t.” Tisch helped with research for the Institute’s reports on the humanitarian, human rights and environmental impact of nuclear weapons testing in Kiribati. 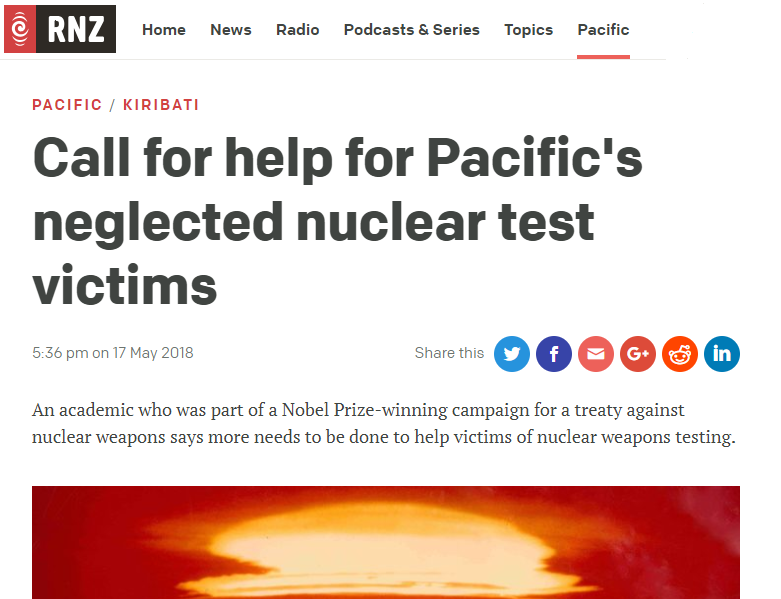 When I found an email from Pace University’s International Disarmament Institute in my inbox asking for applicants for an Undergraduate Research Fellow to assist in a researching on victim assistance for people impacted by nuclear testing in the Pacific, I was excited and, in retrospect, completely unaware of what the position would actually entail. In the past I had conducted my own research projects for class, where the furthest out of my way I had ever gone was visiting the Bryant Park branch of the New York Public Library to look at documents they had stored in their archives. I had also worked on a research project with Dr. Emily Bent, another professor at Pace University, which primarily consisted of qualitative analysis and coding of data that had already been collected. Even after I found out I got the position, was handed a literal “List of Things to Find,” and was told that my search to find various environmental surveys would be difficult, I still could not imagine how difficult that could be. In my mind, at most I would be taking a week’s worth of research to find one of the items on the list; it never even occurred to me that I would be unable to procure any of them. 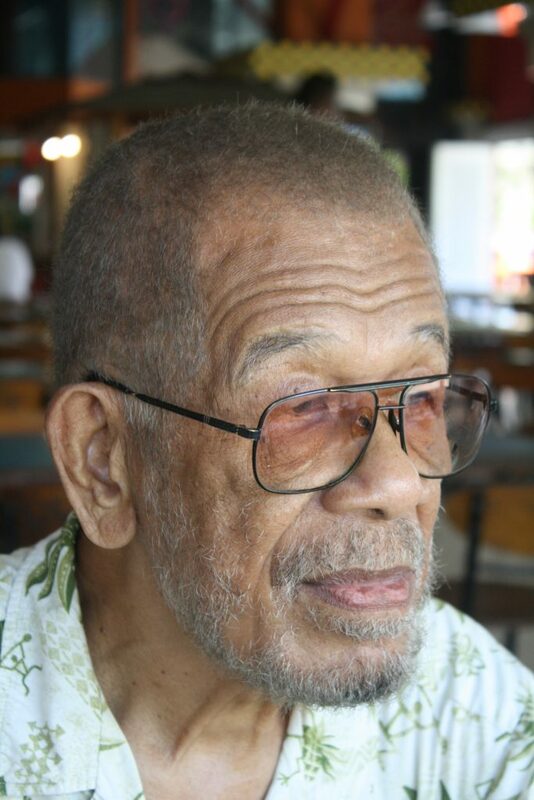 Paul Ah Poy, President of the Fiji Nuclear Veterans Association was posted to Christmas Island during the UK nuclear weapons testing program. Photo: Matthew Bolton. Between 1957 and 1958, Fijian soldiers participated in the nine UK nuclear weapons tests at Malden and Kiritimati (Christmas) Islands, now part of the Republic of Kiribati. Test veterans, including Fijians, and civilian survivors claim their health (as well as their descendants’) was adversely affected by exposure to ionizing radiation. Their concerns are supported by independent medical research. Though the UK government assured coverage of Fijian troops’ service-related health problems during the tests, it has offered them no assistance or compensation. Instead, the Fiji government has stepped in to offer a one-off grant to veterans to support medical and welfare costs in 2015. The 2017 Treaty on the Prohibition of Nuclear Weapons (TPNW), which Fiji has signed but not yet ratified, obligates assistance to victims and remediation of contaminated environments, including those affected by the Christmas and Malden Islands nuclear tests. The International Campaign to Abolish Nuclear Weapons (ICAN) was awarded the 2017 Nobel Peace Prize for the role of its advocacy in achieving the treaty. 276 Fijian troops were among the 15,000 personnel who participated in the UK nuclear weapons tests in and around Kiribati; Fijian dignitaries also visited. Sixty years after the tests there are 32 surviving nuclear test veterans in Fiji, plus surviving spouses, children and grandchildren. Many military and civilian survivors of the Christmas and Malden tests have health problems consistent with exposure to radiation; descendants also report multi-generational health problems. The tests killed thousands of birds and fish. The environmental impact of the nuclear tests has not been adequately analyzed. Sign and RATIFY the Treaty on the Prohibition of Nuclear Weapons. Assess and RESPOND to the humanitarian needs of survivors, including the Fijian veterans. Survey and REMEDIATE contaminated environments at Kiritimati and Malden Islands. RESPECT, protect and fulfill the human rights of nuclear test survivors. RETELL the stories of the humanitarian and environmental impact of the tests. For a more comprehensive report on the impact of the Kiritimati and Malden Island tests, click here.